Dr. Abraham Decow was born in Highgate, Ontario on the 16th of October, 1846. He was the 10th of 11 children, born to William Squire Decow and the former Sarah McIntyre. His siblings included Jacob, Catherine, Ezekiel, Nancy, William, John, Hannah, Jane, James and Sarah. Dr. Decow graduated M.D. in 1870 from The University of Toronto Faculty of Medicine. 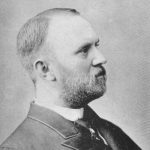 According to the 1892 Ontario Medical Register, he joined the College of Physicians and Surgeons on the 20th of December, 1886. In 1875 he was one of two physicians in Highgate. (Dr. John Murray was the other doctor.) 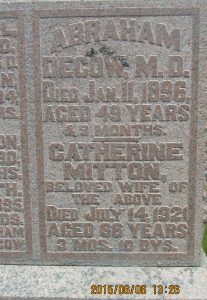 On the 3rd of June, 1879, Dr. DeCow married Catherine Mitton in Howard Twp. Mrs. DeCow was born on the 4th of April, 1854, one of 6 children born to John Mitton and the former Rachel McLaren. Her siblings were; Elizabeth, James, Lora, Charles and Ida. Dr. Decow belonged to the Masonic Lodge 336 in Highgate. His obituary in the Highgate Monitor (January 16th, 1896 edition) stated that ‘he held every rank of honor in the lodge’. Further it stated that ‘he was a member in good standing with the Foresters, Macabe’s, Workmen, and Chosen Friends’. Dr Decow’s medical practice appeared in the 1887 and 1889 Ontario Business Directories under the Highgate subtitle. Dr. and Mrs. Decow had 8 children. Those children were; Sarah Pearl (died on September 5th, 1880 at the age of 1 month and 25 days), John Burton (1881-1956), William Tennyson (died on November 22, 1884 at the age of 1 year, 9 months and 7 days), Charles Abraham (born 1885), Hazel Alfreda (died July 7th, 1899 at the age of 11 years, 5 months and 23 days), Lorenzo “Vincent” (died April 29th, 1913 at the age of 22 years and 24 days) James Keith (died March 21, 1895 at the age of 4 months and 13 days), Hillyard Mitton (died July 7th, 1890 at the age of 6 months). Only John and Charles lived into an advanced adulthood. All the other children are buried in the family plot at the Gosnell Cemetery, near Highgate. Dr. Decow advertised his medical practice in Alvinston (Lambton County) in the 1893 Ontario Directory and Gazetteer. 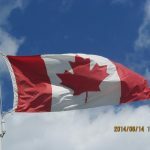 Dr. Decow died on the 11th of January, 1896 at the age of 49 years in Alvinston, Ontario. His funeral service was held at the Highgate Methodist Church and he was buried at the Gosnell Cemetery near Highgate. Mrs. Decow died on the 14th of July, 1921 at the age of 66 years, 3 months and 10 days. Mrs. Decow was buried next to her husband. *Dr. Decow’s sister Hannah married Dr. George Archer Tye. Dr. Tye is also featured on the Chatham-Kent Physician Tribute website. 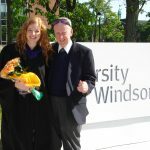 **Dr. John Murray also appears on the Chatham-Kent Physician Tribute website.